This 85-Hour course is designed by the North Carolina Real Estate Commission to prepare you for the state licensing exam and must be completed successfully prior to sitting for the state exam. Purpose of the Prelicense Courses: The primary objectives of the Broker Prelicense Course are (1) to provide students with the basic knowledge and skills necessary to act as licensed real estate brokers in NC in a manner that protects and serves the public interest and (2) to prepare students for the NC real estate license examination. At this School the Prelicense course consists of a total of 85 classroom hours of instruction, including the final course examination. Broker Prelicense Course Description: Major topics addressed in this course include basic real property law, property taxation, land use controls, environmental hazards, brokerage relationships and practices, real estate contracts, real estate financing, closing a real estate sale transaction, real estate valuation, fair housing, landlord and tenant, property management, federal income taxation of real estate, basic house construction, basic real estate investment, the North Carolina Real Estate License Law and North Carolina Real Estate Commission Rules and Trust Account Guidelines. Real estate mathematics is an important component of this course and calculations will be required. Requests for Special Accommodations: Students requesting special accommodations must specify the accommodation needed at least one week prior to the class start date to make sure that the School can accommodate the need. East Carolina School of Real Estate complies with the Americans with Disabilities Act and strives to ensure that no individual with a disability as defined by the ADA is deprived of the opportunity to participate in a course. Detailed Schedule of Tuition and Fees: East Carolina School of Real Estate accepts the following forms of payment: Credit Card (MasterCard, VISA, Discover, American Express) Personal Checks, or Cash. Payment can be made when registering on the website. Tuition must be paid as follows: At time of course registration. No Exceptions! The penalty for a check returned for non-sufficient funds will be: Original amount of dishonored check plus $25 fee paid to the School by bank check or money order prior to student readmission to the course. Textbook* IS NOT included in Broker Prelicense Course Tuition. *Textbook price is $ 50.00. Students who do not pass the Course Exam and the Retake Exam can repeat our Broker Pre-Licensing Course one time during the next 12 months for a $100 Administrative Fee. If you need to repeat our Broker Pre-Licensing Course, please call the office at (252) 364-2999 to reschedule the course. We take Mastercard, VISA, American Express and Discover. Course Cancellation or Rescheduling / Refunds: East Carolina School of Real Estate reserves the right to cancel or reschedule a course as needed. Students enrolled in a rescheduled or cancelled course will be given a minimum 5-day notice of the cancellation or revised course schedule. If a course is cancelled or rescheduled, students will have the following options: Carry Tuition Fee forward for one year to another Course. Withdrawals and Transfers / Refunds: A student may withdraw from the Broker Prelicense course by giving written notice to the School at least 72 hours prior to the start of the course and will receive a complete refund. If cancellation is within 72 hours prior to the start of the first class, we will be happy to transfer the tuition fee to another course offered by our School within the next year, however, no refund of any portion of the paid tuition will be given. A student who terminates enrollment in a Prelicense course after the course begins either by written notice to the School or by no longer attending the course will be allowed to carry forward the tuition fee to re-take the course for a period of one year from the original start date of the terminated course. A final exam will not be administered to any student who does not satisfy the attendance requirement. Attendance will be closely monitored in every class session, including late arrivals and early departures at the beginning or end of class sessions or any scheduled break times. All time missed will be recorded for each student. Attendance sheets will be signed by students at the beginning of each class. pass the final exam with minimum score of 80%. The final exam will be administered on the last, scheduled day of the course. Students are not permitted to bring laptops, tablets, cell phones or similar electronic devices (other than a basic calculator) to the classroom on the day of an exam. Any student who brings such a device to the classroom on the day of an exam will be required to remove it from the classroom before the exam commences. If a student is discovered to be using such a device or cheating in any other manner during an exam, the student will be immediately dismissed, will receive a failing grade, will not be eligible for any retake or makeup policies, and will be reported to the NC Real Estate Commission [per Commission Rule 58C.0304]. East Carolina School of Real Estate WILL allow a Prelicense course student who does not take the final exam on the last scheduled day of a course to take it as a makeup one time within 90 days of the last scheduled day of the course at a time and date stated by the School. 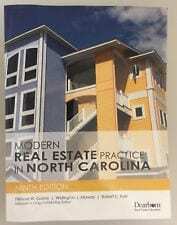 East Carolina School of Real Estate WILL allow a Prelicense course student who takes but does not pass the final exam on the last scheduled day of a course to retake the final exam one time; however, the retake must be within 5 days of the last scheduled day of the course at a time and date stated by the School. Prelicense course students must attend a minimum of 80% of all scheduled classroom hours. 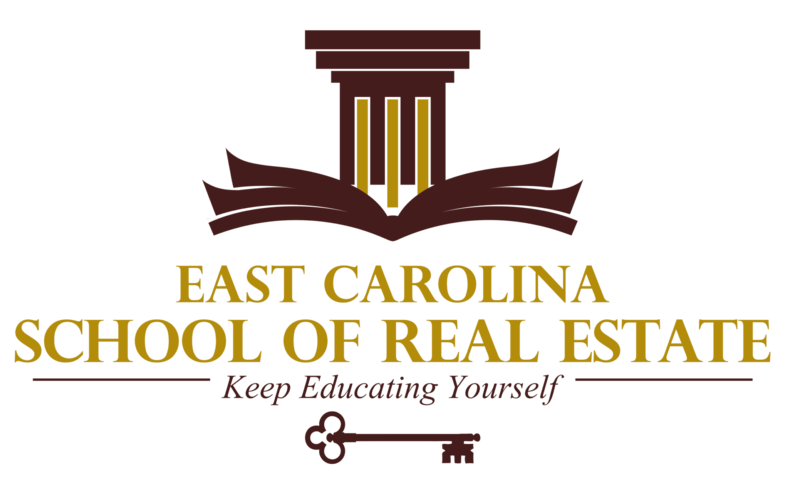 At East Carolina School of Real Estate, a student may retake a Prelicense course for $100.00, subject to the following conditions: Students who do not pass the Course Exam and the Retake Exam can repeat our Broker Pre-Licensing Course one time at the reduced tuition during the next 12 months. Student Conduct: Students are expected to conduct themselves in a professional manner. Dismissal without recourse will be imposed for behavior that, in the judgment of instructor or staff, reflects negatively on East Carolina School of Real Estate. No refund will be given if student is removed from the classroom because of inappropriate behavior or conduct. Inclement Weather: In the event of inclement weather or a local or national emergency, students will be informed of class cancellation and notified of the make-up day during the next regularly scheduled class attendance date. East Carolina School of Real Estate is not responsible for lost or stolen electronic devices. East Carolina School of Real Estate DOES provide wireless Internet access. If wireless Internet access is provided, East Carolina School of Real Estate is not responsible for disruptions in or problems with the service. East Carolina School of Real Estate DOES allow the use of laptops, tablets, and similar devices in the classroom provided they do not distract from the learning environment. Students may use electronic devices to enhance their learning, including taking notes,researching class topics, or viewing the on-line version of the NC Real Estate Manual. Sending personal emails/texts, shopping online, visiting social networking sites, or playing games are considered to be disruptions and are not acceptable student conduct. If an instructor discovers that a student is using an electronic device for these (or similar) purposes the student will be asked to turn off the device during the remainder of the class. Instructors, at their discretion, may designate times during which students may and may not use their electronic devices during class sessions. If an instructor has directed students to discontinue use of electronic devices, all students must put away their devices immediately. If a student does not follow an instructor’s direction to discontinue use, the student will be excused from the class. Sound on electronic devices must be muted during class sessions. The use of electronic devices (other than a basic calculator) is strictly prohibited during quizzes and exams. Visitors / Guests: Courses at East Carolina School of Real Estate are open to enrolled students only. Enrolled students MAY NOT bring visitors or guests to the classroom.